Images and content throughout this site may not be used without written consent. Other logos and images used belong to their respective owners and are used with permission. with the help of this easy to use e-book"
The heart and soul of your wedding day is your wedding ceremony. In those few minutes you want the special words to welcome your guests, honor what love and marriage mean to you, speak your words of love and commitment to your beloved before your family and friends, and perhaps have a blessing as the first words you hear in your marriage. What wedding vows will speak your heart? What words set just the right emotional tone? You're just who this e-book is written for! If you want a traditional ceremony with just a few unique touches, a totally unconventional ceremony, one that honors two faith traditions, or a wedding with no religious reference at all ? There are lots of examples to choose from. 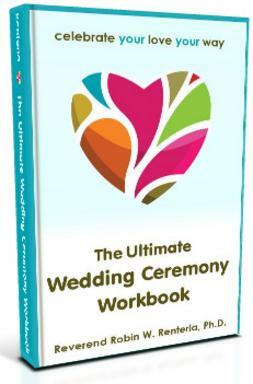 This e-book also covers all the non-text ceremony details so you can relax knowing everything has been considered. Working with Robin was such a blessing! Looking back on our wedding, the actual wedding ceremony was our favorite part of the whole day. With Robin's help (and her 150+ page wedding ceremony book! ), we were able to personalize each detail of our ceremony - from the readings we chose, to having all our family and friends pronounce us husband and wife. Thanks so much Robin - we couldn't have asked for a more perfect day! to give you the best resources from over 17 years of officiating over 1,000 weddings for loving couples of all faiths, cultures, and lifestyles. If you have a question or an idea to share, email Rev. Robin Renteria. to add to the book. If you want to know more before you decide. If love is the answer. could you rephrase the question? Robin did a phenomenal job ... each word in our wedding ceremony spoke to our specific love and commitment. We had 150 guests at our wedding ceremony and literally every single one mentioned to us how beautiful the wedding ceremony was, how it was 'so us'! Even my father and a few of my bridesmaids asked that I email them the wedding ceremony because they loved it so much and wanted to relive the words and wisdom Robin spoke of on our day. She sent all kinds of different choices and examples of wedding ceremonies, and allowed us to build our own wedding ceremony from her resources which she then put the finishing touches on. 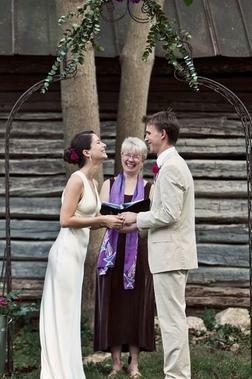 Robin was a wonderful officiant at our wedding. Ahead of time, she worked closely with us in drafting a ceremony that was just right for us. ... She had lots of materials that helped us figure out exactly what we wanted in our wedding ceremony. Robin was an AMAZING officiant for our wedding. ... She has awesome readings/wordings to choose from, and will do anything she can to help you personalize your wedding ceremony. enjoy exploring all the choices. The Hand Ceremony, and more! And more! See the Table of Contents. purchase you'll make for your wedding! * Instant Download! No more waiting or finding the time to go shopping! * No heavy book to carry around. * Ease! 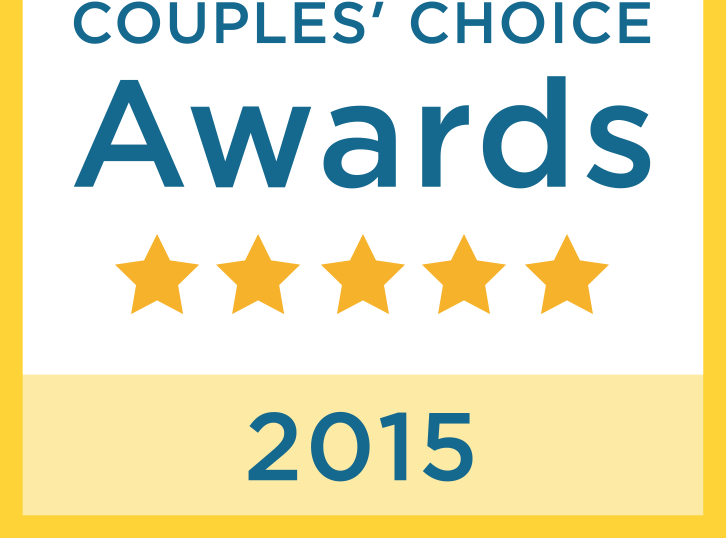 Easy to read, easy to navigate, and easy to bookmark what calls to you. * You Save Trees! -or - you can print out only the pages you want. She wants these wonderful words of love to launch your marriage with all the joy and celebration it deserves. Pay $12.95 on Paypal to rwrenteria@gmail.com. who will then send PDFs to your email address.